My review of season 2 was heavily mixed. I adored the substance of the show (the writing, the characters, the stories, the humour the direction) but felt badly manipulated by the production team. After just three episodes they left us on a frustrating cliffhanger and cheerfully waved goodbye, see you in 2 years. 2 YEARS! Almost to the day in fact. It wasn’t even a proper cliffhanger, we weren’t wondering whether Sherlock Holmes was really alive, because they showed he was, but just about how he did it. That was all, just the mechanism. Sherlock the series did exactly what Sherlock the character does, leaves you struggling to put together the final details and revelling in the fact that it/he is so much cleverer than you. It felt like a somewhat crappy way to treat your audience. But like the character, the series can get away with it because it’s brilliant. So despite feeling slightly used and dirty about the whole thing, I was as eager as anyone to find out the answer. I actually watched a television program live. That was how eager I was! And wouldn’t you know it, they turned it around. I said in my season 2 review that I feared they would resolve and dismiss the cliffhanger in the first three minutes (as they did with the one between seasons 1 and 2). But they really didn’t. They not only took their time with the actual explanation, but they didn’t skim over the emotional fallout either. We saw the effect the deception had on Watson (more of that later) but we actually saw how it effected Holmes himself! We get to see a different Sherlock this year, one who actually makes and embraces connections with people. Ok some of those connections turn out badly or as part of a scheme, but still. He’s not exactly changed, but he is a bit more open. It’s that openness which I think may have frustrated some people. The criticisms about the series playing too much to the fans. I think it’s fair to say there was a lot of fan-service this year, with the various comedy variations on Sherlock’s not-a-death, seeing Sherlock drunk, in a relationship and acknowledging how important John is to him. But I don’t see that as something to be overly critical of. Yeah, the speech at the wedding had maybe too many touchy-feely moments in it and I cringed a bit at many of the imagined deaths, but if that’s what the people who adore the show and have patiently waited for it want, then isn’t rewarding them something to be praised not criticised? Who is the show for? The people who watch and love it, or the critics? Maybe the complaints are just because you have to look so phenomenally hard to find something wrong with the show. Because it is damn near perfect. The simple elegance of the writing belies how (apparently) hard that is. With the possible exception of The Good Wife, nothing on television at the moment comes close to the pure quality of this production. 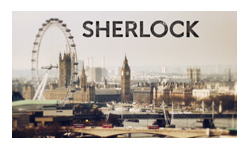 Maybe that’s because Sherlock is really a miniseries not a series, but then so is Downton Abbey and Sherlock has more talent in its episode titles than an entire season of Downton has. Each episode is a delight to watch. It’s a show I go out of my way to watch live and one I desperately try to watch with other people, because the experience is so reliably wonderful that I want to share it. That did mean that were plenty of moments admittedly that I had to snivel discretely into my tissue mind you, largely driven by the utterly superb performance from Martin Freeman. Benedict Cumberbatch is of course dreamy and wonderful (the moment where Sherlock as the French waitor realises that he’s miss-played this one being a particular standout) but for me it’s all about Martin Freeman. He’s the heart and soul of the partnership and the show as a whole, he’s the perfect straightman – effortlessly stealing every single scene and moment. Added to the mix was Mary, the perfect blend of Watson’s humanity and Holmes’ smart manipulation and you’ve got the perfect mix. The writers certainly played to their strengths this season. They know exactly what they have in their two leading men (headhunted left right and centre for massive Hollywood productions) and they provide them with just the material they deserve. It’s the perpetual blessing and curse of Sherlock – incredible actors mean very difficult timetables. So we are left with a wait of who knows how long before we get to see them again. I thank the writers from the bottom of my heart for the lack of cliffhanger. Unlike last time, I’m left with no bitterness, just a pure joy at getting to watch the offering of a group of people at the very tops of their professions.